Tami was born and raised in rural Maine but moved to the Arizona sunshine 19 years ago! She graduated from the University of Maine at Orono with a degree in Animal Science and began her career in veterinary medicine. 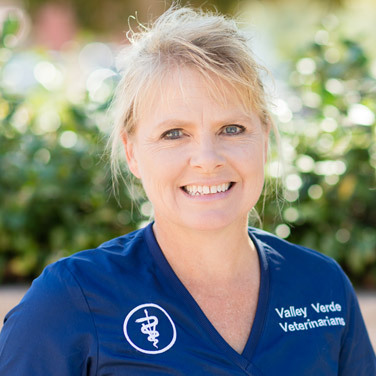 Tami has been with Valley Verde Veterinarians since its inception in 2011 and plays an integral role in the practice. She wears many hats as the practice manager, the lead technician and overseer of most projects that we undertake. Outside of work Tami enjoys competing in Ranch Pleasure events with her horse, Steve, and enjoying time with her husband, Michael, twin daughters, Brianna and Hannah, and her son, Tyler.